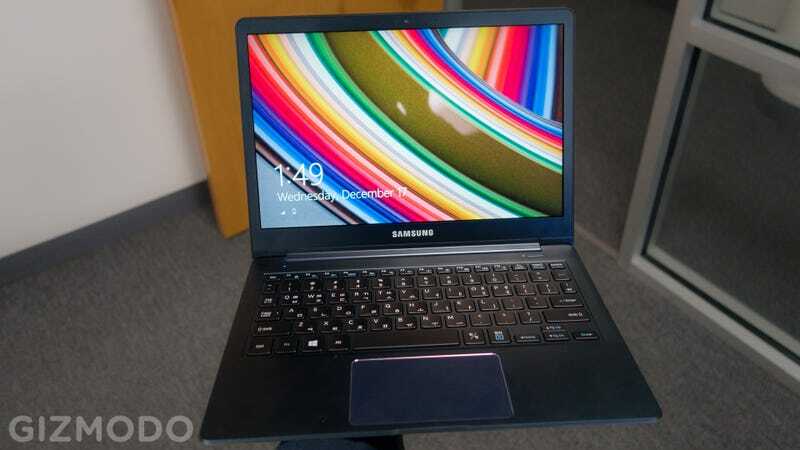 Samsung's handsome, stylish, horribly named ATIV Book 9 ultrabook is getting an update this year at CES. Thanks to Intel's new Core M processor, the new Samsung ATIV Book 9 2015 (*gags*) is lighter and slimmer than ever. At .46 inches thick and just over two pounds, its aluminum body is both thinner and lighter than the 11-inch MacBook Air, despite repping a squarish 12.2-inch 2560 x 1600 display. A non-touch display; Samsung's bracing for the more mouse-friendly Windows 10 already, even though the Book 9 will ship with 8.1. Inside is a Core M 5Y10c, one of Intel's mobile-desktop hybrid chips that let laptops slim down like crazy, but at the cost of a some processing power. It's a similar brain to the one that left us feeling cold after using similarly slick Lenovo Yoga Pro 3, and the ATIV Book 9 is no doubt similarly form over function, but damned if its not a pleasure to touch and type on. Like its predecessor, the Book 9 2015 has a fantastic little keyboard, with a subtle curve that hugged my fingers delightfully when I typed on it. Also, it's got a few handy software features, like an "outdoor" mode that lets you crank up the display to twice its typical max brightness—at the cost of battery power, obviously. The ATIV Book 9 2015 starts at $1,200 for 4GB RAM and a 256GB SSD. $1,400 if you wanna hop up to 8GM RAM. The pretty little sucker goes on sale early 2015, but don't hold your breath if you're looking for a real powerhouse.